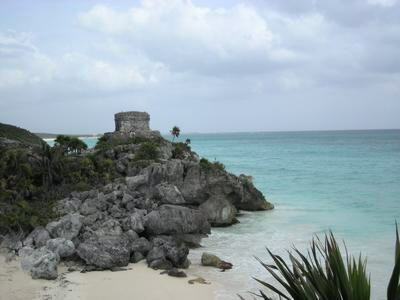 Tulum is the only walled city that the Mayans constructed on the Caribbean coast. It is of the more famous archaeological vestiges of the world and is one of the most beautiful cities of the Mayan culture. Its wonderful construction on a cliff provides one of the most spectacular views of the Caribbean Sea. Constructed in the Classic period of the Mayan culture, around 465 A.D, its original name era "Zama" (dawn) and is located in the high part of one of the few cliffs along the coast of the Mexican Caribbean, which allows a great view of the sea. Zama was renamed Tulum, which means "Wall," at the beginning 20th century. It is considered an important point of Mayan commerce and navigation in addition to a fortified city-refuge. Opinions vary on the reason for the walls exist; some think that they were constructed to defend against attacks. Others think that they were placed to separate the nobility and the ceremonial center of the rest of the city. In recent years it has been discovered that it was even used for night navigation since lights placed in the windows of the Castle, their main building, serve perfectly to locate reefs along the coast for navigators who move north and south. In this zone important representations of the Gods Ixchel and Chac exist. In addition to the Castle and the wall, in Tulum there are other structures like the Temple of the Descendent God, important Mayan deity that was represented by the bee, giver of honey. Also this Temple it was possible to date the beginning of the construction of Tulum, the Temple of the Fresh airs, the House of the Columns and the wall with observatories in the western corner. Tulum is unique among other Mayan cities in that she continued to prosper for several decades after the Spanish conquest, longer that any other place in the coast. The Spaniards were very impressed with Tulum and said that it was as great as Seville. It was again occupied in 1890 - 1910 by a group of Mayan dissidents. 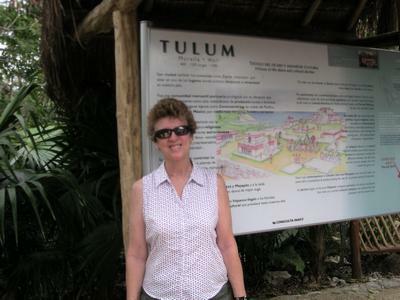 Tulum tours available to cruise passengers booked by Janet only and as a free tour. Ask Janet how to get a free Tulum tour.